Tower-defense games (where you deploy battle resources to defend yourself from wave after wave of attack) usually involve modern-day soldiers, knights and otherworldly beings, futuristic spacemen and robots—some variation of military resources. 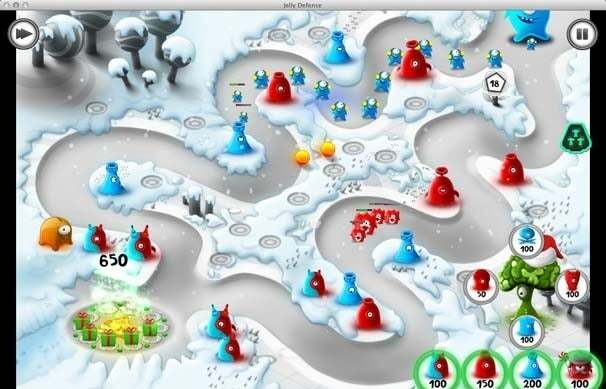 Jelly Defense (Mac App Store link) opts for something different, something much more quirky: jelly creatures. But game developer Infinite Dreams provides more than just cute critters in Jelly Defense, and the result is a refreshing take on the genre. Your job on each level of Jelly Defense is to defend a set of crystals from the jelly invaders who travel predetermined paths that lead directly to your crystals. You defend yourself by placing battles towers (yes, jelly towers) along the path; each tower has a specific weapon and attack range, and they can only attack invaders of matching colors. Each tower costs money, but fortunately, invaders tend to drop coins after they’ve been defeated. The levels increase in difficulty as you progress. The invaders vary in capability—some are faster than others, some have longer lives than others—and in higher levels, there are multiple paths you must defend. You must also think carefully about tower placement, since the effectiveness, range, and cost of each tower varies, and you have a budget to work with. What makes Jelly Defense enjoyable is that it successfully combines challenging gameplay, attractive graphics, and a playful soundtrack. There’s nothing complicated about the graphics, but they have an appealing cartoon-like quality with a style that was carefully thought-out and not hastily put together. The soundtrack features catchy, well-produced tunes with lyrics in Polish. (Actually, I don't recall extensively hearing Polish being spoken in my life, so I have no personal point of reference. I've deduced that it's Polish, based on Web research. Infinite Dreams is also based in Poland.) The songs were done by an artist who goes by the name Hipki, and you can preview the soundtrack on YouTube, or buy it on iTunes. The songs stick in your head—you’ll find yourself singing a Jelly Defense tune while standing in line at the grocery store. Jelly Defense was originally released as an iOS game (it's available for iPhone and iPad for $3), and the Mac version doesn’t stray from the original. The fact that the game was designed with iOS in mind is clear in the game’s interface. Much of the game is spent selecting a tower in your arsenal, placing it, and then collecting the money from the dead invaders—tasks that work well with the iOS touch interface. On the Mac, however, you have to move a cursor to use the Jelly Defense’s user interface, and it’s clear that Mac input devices aren’t the most efficient way to work the game. Jelly Defense is still very playable with a mouse, less so with a trackball. I found that a trackpad was just about impossible to use—I couldn't get the hang of tapping and dragging on the trackpad for the game specifically, and when the pace was extremely fast, it was failed experience for me. If you’ve played the iOS version of Jelly Defense, stick with it—you’ll find the controls on the Mac version somewhat limiting. But if you haven’t played Jelly Defense, the $5 Mac version is a very good version. You’ll find it an entertaining twist on the tower defense genre of games. It’s addictive and entertaining.